We’ve had the pleasure of working with Chris from Rumba for many years. We initially designed our BARMADE stainless steel bar system for his very first venture, and we’ve helped him create some of Cheshire’s most vibrant venues since. Polynesia, Mexicana-meets-Miami, and tiki-nautical: just some of the words that cropped up in this unusual project brief. Our design team worked hard to solidify this concept into a cohesive and workable bar and restaurant design. We wanted RUMBA to feel authentic - like a beach party that had just been pulled together. We installed booth seating in tropical colours, fixed table/bench combinations in metal and wood, and high stools complete the look. We began the RUMBA project with little more than an empty shell. Our team managed the entire, eight-week process - from design and drawings right through to manufacture, installation and finishing touches. RUMBA is the home of Snake Pit Rum. We used this brand as the basis for the bar’s outside area, framing the logo above the bespoke multi-coloured bench seating and sun loungers. Our first idea was to source vintage caravans for the VIP booths. After some consideration, we decided to build the ‘caravans’ from scratch, creating perfect wood frames and accessorising with genuine 1970s parts including windows, wheels and chassis. We created a sand-effect resin floor, complete with pebbles sunk into it, to complement RUMBA’s Miami-Mexico beach theme. And in the evenings, this unique, durable flooring provides a space for customers to dance the night away. The Barmade ultimate cocktail stations was used in the design for this high volume venue a 12 meters long incorporating 6 stations, deep blender sinks and speed rails, speed of service without affecting quality was the number one priority for this design. 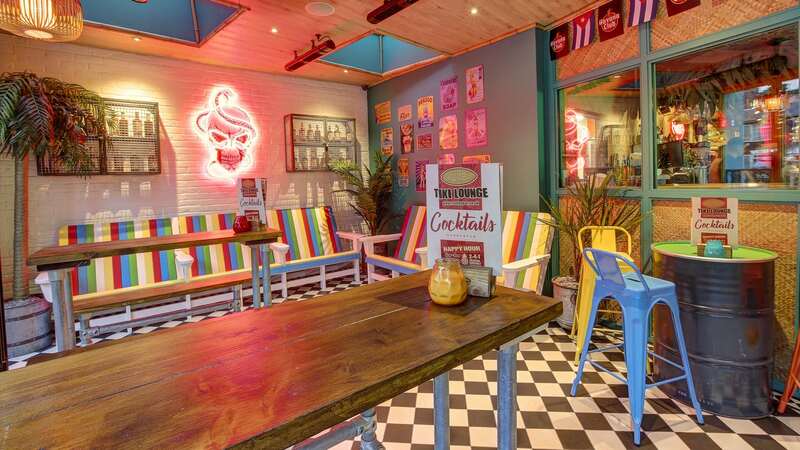 RUMBA is serving up a slice of beach life in Cheshire with its new bespoke commercial kitchen, which speeds up the preparation of easy eats with a pressure-fryer for the southern style chicken and custom pizza oven. The brief was to create a venue with two distinct feels: a family-friendly day-time drop-in, and a party place for evenings and weekends. Our design needed to be versatile in both look and function. Too often, toilets are a place to cut costs at the expense of design. Not for us: we used hygiene-finished corrugated steel for a shipping container feel, and matched custom metalwork with clashing colours and patterns. We all remember the joy of ice cream on the beach. RUMBA now boasts a custom ice cream cocktail station, where bar staff can take childhood classics and add a cheeky, boozy twist. RUMBA Congleton is where Life & Soul decided to go all out with their visual design. The visual impact of the bar is undeniable, with a noisy blend of materials, textures, colours and patterns everywhere from floor to ceiling. Attention to detail is the key to this eclectic look. Dawnvale have helped me to achieve my vision. We had plenty of ideas, and Dawnvale have really twisted the design on its head to achieve something totally unique. There is so much to look at at RUMBA Congleton - the venue attracts so many different types of people and it is so much fun. This isn’t a pretentious place; it’s beautifully finished, precise, down to earth and it looks great.